For stuffing – Par-boil peas and cauliflower florets. Take a bowl, add peas, cauliflower, coconut powder, salt, ginger paste, green chillies, lemon juice and mix it well. Keep it aside. Take a bowl, add boiled potatoes and mash it. Take slices of bread, sprinkle about 1-2 teaspoon of water and mash it. Mix it with potatoes, add salt, ginger paste, green chillies and mix it well. 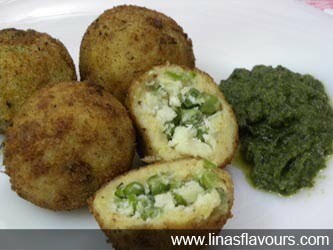 Make 12 balls from potato mash. Wet your hands with water or oil. Take one ball and flatten it with your hands. Put 2-3 teaspoon of stuffing and cover it from all the sides and roll it into a ball. Make all the balls this way. Take a bowl, add maida, salt and water and make a thin batter. Dip the balls in the batter and roll in fresh bread crumbs. (You can take 5-6 slightly dried bread slices and coarsely grind it in the mixer or food processor) or use readymade which you get it in the market. Take a frying pan and heat oil. Deep fry all the balls in small batches on medium flame. For serving, cut the balls into half, pour green or mint chutney on top and serve it immediately.